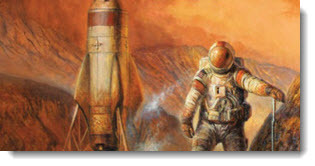 In this issue: surviving at trip to Mars, a classic Honor Harrington novel stunningly reborn, and a pirate hoard of “black gold.” All that plus the June contest. High Adventure in the New World! Oil. The Americas have it. The United States of Europe needs it. Without oil, all hope of the time traveling town of Grantville, West Virginia to bring science and industry into the heart of a European continent still crawling out of the Dark Ages is lost. Enter Lieutenant Commander Eddie Cantrell, daring up-time commander of this venture into western oceans. The Spanish are after him, and so are other enemies with even fewer scruples—every one of them determined to hang the commander from a yardarm. 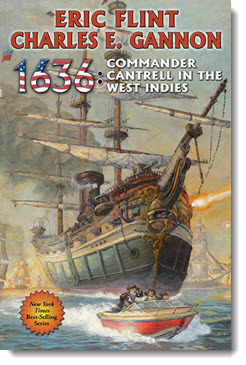 Get 1636: Commander Cantrell in the West Indies now. Surviving a Mars Mission Worst Case Scenario! In the year 2035 space exploration is a reality, and the first manned mission to Mars is away. Sending humans into space is risky—but are the risks worth it? The astronauts and mission specialists of the Arrow—a crew set to be the first humans on Mars—think so. But powerful political forces on Earth disagree. When a fluke collision hobbles the ship, it's not only the lives of the crew that hang in the balance, but the future of manned space exploration itself! Back from Mars, Now What? You’ve just returned to Earth from a five year roundtrip mission to Mars. Tell us five things you absolutely must do when you return. “I’m going to Disney World,” is up for grabs, for instance! 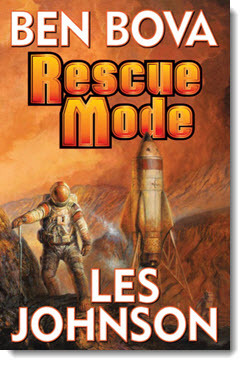 Let us know for a chance to win a signed copy of Rescue Mode. 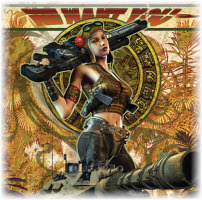 Fascinating conversations with your favorite Baen writers and artists about the books you love. Coming soon: Eric Flint and Charles E. Gannon discuss 1636: Commander Cantrell in the West Indies; Ben Bova and Les Johnson on new hard SF novel Rescue Mode, and the future of a manned expedition to Mars; P.C. Hodgell on Rathilien fantasy world-building and the Kencyrath as she talks about her latest Kencyrath novel, The Sea of Time. Larry Correia on Monster Hunter Nemesis; David Weber on the 21st Anniversary leatherbound edition of Honorverse series book two, The Honor of the Queen; Monster Hunter cover artist Alan Pollack discusses his work on the series and more; Steve White on new Jason Thanou Civil War time travel novel, Ghosts of Time—and the chief of creative content at Evergreen Studios has the latest on the new Honor Harrington film that's in the works! And don’t forget to check out the latest issue of Tales of Honor, a five-part comic based on Weber’s On Basilisk Station. Click here to download a free preview of the first issue, purchase issues #1 and #2, and watch a video on the adaption process. Lieutenant Commander Eddie Cantrell must travel to the Caribbean to secure access to the most valuable commodity on that continent—the oil which up‑time machines and industry need. But when the Spanish finally come out in force to engage his small flotilla, Eddie will discover that they aren’t the only enemies who will be coming for him. When a fluke collision with an asteroid hobbles the first manned Mars mission, it's not just the future of space exploration that hangs in the balance—but the lives of the crew, as well. The Kingdom of Manticore needs allies against the Republic of Haven—and the planet Grayson is strategically situated to make a very good ally indeed. When Grayson’s fratricidal sister planet attacks without warning, Honor Harrington knows she must stay and prevail. Kothifir the Great: a land where time shifts. Here Jame arrives to find that Kothifir's gods have lost their power and its proud towers are falling. In order to save the present, she must search the past to save Kothifir—without undoing time itself. Draw One in the Dark: She’s hidden her gift/disease for years, wondering if she were even human. Now she has found others like her—shifters waging a secret and terrible war in the shadows of everyday life. Gentleman Takes a Chance: A primeval Shifter feud grows infinitely more deadly, and shapeshifters Kyrie and Tom find themselves warriors in an ancient struggle for Shifter destiny itself! Private eye Jake Sullivan must put together a ragtag crew of airship pirates and Grimnoir knights for a suicide mission to stop a predator from a dark universe from destroying the source of mankind’s magic. Hugo-nominated novel! Jason Thanou of the Temporal Regulatory Authority once again faces down the Teloi and Transhumanist menace in Old Earth’s blood-soaked past. This time with the help of legendary pirate Captain Morgan. A deadly feral shifter is loose in normally quiet Goldport just as dragon shapeshifter Tom Ormson must challenge for the leadership of his clan. 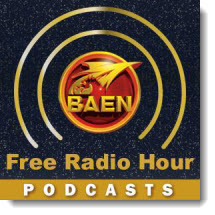 Don't forget to check out the newest ebook releases here, plus Baen.com free fiction from P.C. Hodgell here. Also, don’t miss the monthly free nonfiction, article, “Blooded by Starlight” by Jonathan LaForce here.